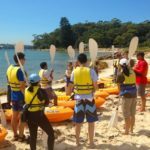 Hobart Sea Kayaking Tour – Cliffs, Caves and Beaches: Enjoy a relaxed kayaking experience exploring Hobart’s diverse Derwent River and coast line. 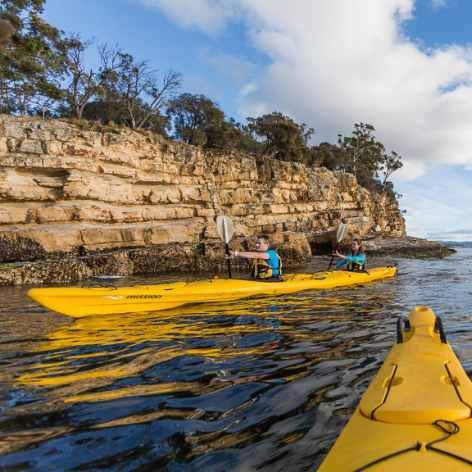 You will be kayaking through the stunning Tinderbox Marine Nature Reserve, just 20 minutes from Hobart’s CBD. The Hobart Sea Kayaking Tour will have you kayaking amongst peaceful, quiet bays and beneath the lichen-covered Alum Cliffs. You can explore sea caves and enjoy views of Bruny Island and leave your footprints on some of Hobart’s sandy beaches. For lunch, you will be served some of Tasmania’s famous produce whilst relaxing on one of our many beautiful beaches. Abundant wildlife abounds in the Tinderbox Marine Reserve home so keep a look out for majestic white-bellied sea eagles, stingrays, seals and if we’re lucky a pod of dolphins or a migrating whale. This full-day sea kayaking tour is operated in a one-way direction, depending on the forecast winds. The Hobart Sea Kayaking Tour is a relaxed and easy paddle, so we recommend it for beginners and children over 10 years old (when accompanied by an adult). 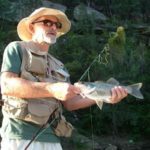 Passionate and experienced local guides. All kayaking equipment, warm all-weather protection gear. Suitable for ages over 10 years. 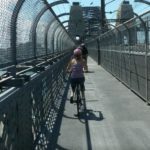 Children 10–16 yrs must be accompanied by an adult. Comfortable quick-drying clothes suitable for the weather. Change of clothes for the trip home. Tours run November to April. Paddling time is 4 to 5 hours.